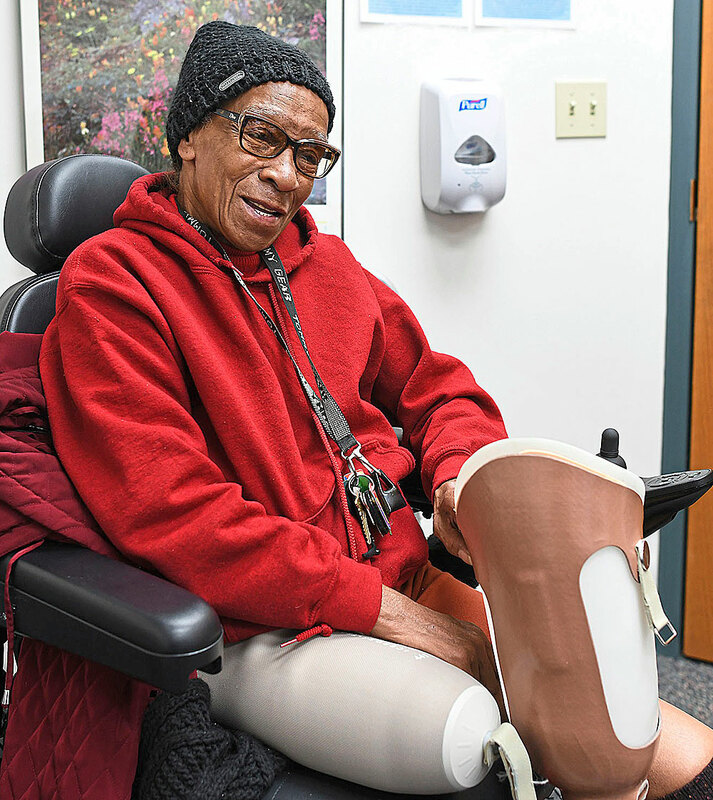 Getting the right fit with artificial legs and feet can be painful and frustrating for people like Ms. Hines, a retired hospital aide who lost much of her right leg to amputation five years ago after knee repair surgery and an infection. A power wheelchair makes it possible for her to get around as she struggles to get the right fit for her artificial leg. Status: Often uses scooter for mobility. Problems with the fit of her prosthetic has made walking uncomfortable. And she’s hardly alone: Prosthetics is a laggard of modern medicine — part science, part craft, a specialty in which intuition and the child’s modeling compound Play-Doh are still used to find the proper fit for an artificial leg. There’s no Yelp for silicone rubber limbs. Rejection of patient insurance claims is common, and independent research on what works best for a given patient is lacking. What’s more, a poorly fitting artificial limb can start a downward spiral in the overall health of an amputee. Joshua Caputo wants to bring prosthetics into the 21st century through his startup company, HuMoTech LLC. HuMoTech, which was founded in 2015 and employs five people, began turning a profit in its second year, he said, although he did not release financials. The company markets a device to research centers that allows real-time evaluation of various artificial lower-limb designs, while shortening the time from a month to hours between an idea and a new prosthetic device. “The core problem is that patients don’t have a choice,” said Mr. Caputo, 29. His challenge is twofold: Solve the fit and other problems that patients face while structuring a sustainable business that can stand on its own in a highly fragmented industry. Diabetes is a big reason for 185,000 lower-limb amputations annually, with the total number of people missing limbs estimated at 2 million in this country, according to the Amputee Coalition of America, a Manassas, Va., nonprofit. The rise in obesity and diabetes will double the number of people with amputations in the United States during the next 40 years, according to a 2013 study that appeared in the journal Plos One. Still, market size is a challenge. Some 3.6 million people are forecast to have amputations by 2050, according to the Amputee Coalition, a number dwarfed, for example, by the 78.1 million people who should be on cholesterol-lowering drugs, according to the Centers for Disease Control and Prevention. At the moment, there are hundreds of limb and foot prostheses available in a highly splintered market. Artificial limb maker Hanger Inc. of Austin, Texas, estimates that it controls 20 percent of the prescription orthotic and prosthetic device market — and that no competitor has more than 2 percent. The 2015 global market for prosthetics: $1.62 billion, according to Future Market Insights of Valley Cottage, N.Y. Despite the inspiring stories of war veterans being fitted with the latest high-tech arm, the far more common story line is one in which a doctor writes a prescription for an artificial limb, and a master’s degree-trained prosthetist fills it using intuition and a rubber, off-the-shelf device. And patients are more or less stuck with the first prosthetic they receive because insurers will not pay for a replacement for several years, Mr. Caputo said. He found the real human problem in 2011 while visiting a clinic run by Dr. Miknevich. What he remembers was the anger, tears and hopes of people with amputations who just wanted a part of their old lives back. Mr. Caputo realized that technology alone couldn’t bring artificial limbs into the 21st century. “I got into this to develop cool technology,” he said. “But technology is not the solution to every problem in the world. Status: One leg was lost in the accident, the other was severely injured. Uses one artificial leg. Has had 10 different artificial leg designs since 1990 because of fit problems. Solving the issues will include finding a way to address frequent insurance claim denials from patients, the dearth of independent research in the field and other hurdles, which will have to be wrapped around a sustainable business plan. University graduates are often smitten by technology, says James Jordan, president and CEO of Pittsburgh Life Sciences Greenhouse. He met Mr. Caputo about a year ago before developing a mentoring relationship with him. In Mr. Caputo, Mr. Jordan said he saw a “brilliant roboticist” and someone who was coachable and open to learning about the life sciences startup game. The challenge for Mr. Caputo — and every entrepreneur — has been finding the most compelling problem in a constellation of problems; identifying investors and customers, people willing to pay for a solution; and finally identifying the bigger outfits that are likely to eventually come knocking, talking acquisition. “It was a follow-the-money moment,” Mr. Jordan said about his discussions with Mr. Caputo, adding that the obstacles to innovation in prosthetics can be discouraging. Technology hasn’t completely bypassed the field of prosthetics. Load sensors, computer chips and other gizmos are being tested by patients with amputations. Matthew Erway, for example, was recently fitted with a leg and foot prosthetic guided by a computer chip. It replaced a hydraulic piston-equipped knee. Ms. Hines and Mr. Erway are patients of Dr. Miknevich who came to a recent clinic for people with missing limbs that she sponsors, where she tries to resolve fit problems. Status: Was recently fitted with artificial knee with microprocessor, which has made walking easier. Mr. Erway’s knee cost his health insurer $60,000. Those kind of numbers are one reason that rejection of claims is common among people with amputations, prosthethists said. Insurers increasingly demand proof that more expensive options work better than less costly ones. 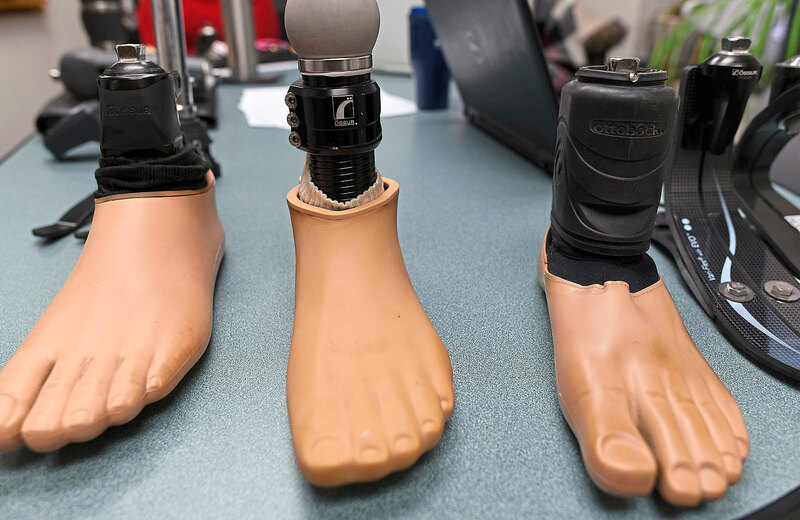 Artificial lower limbs start at $19,000 and the field doesn’t attract the research dollars necessary for insurers to justify covering cutting-edge — and more expensive — devices. “There’s not enough evidence to guide decision making,” Mr. Caputo, whose single-car garage-size lab is located behind his home in Stanton Heights. HuMoTech’s product, called an emulator, is a souped-up treadmill that allows researchers — and maybe patients one day — to try out next-generation artificial feet and legs. Emulators cost between $100,000 and $200,000, and they are built in HuMoTech’s workshop for shipments around the country. The devices are not used to fit patients today because neither Medicare nor commercial insurers reimburse for the service. Mr. Caputo began designing the emulator as a doctoral student at CMU in 2010, revising the design over the years to create the commercial-grade device that has been sold to Georgia Tech, Stanford, Vanderbilt and the Department of Defense, among other research institutions. The emulator is already sparking interest in new research, replacing trial-and-error guesswork with real-time analysis of aritificial limb comfort and performance, Mr. Caputo said. With an emulator, people with amputations can experience various resistance and comfort levels in artificial joints, cutting the time needed to find the right fit to hours from months. Mr. Caputo worries about making it all fit — the prosthetics and the business strategy. He worries about the reimbursement challenges for patients, the fitting issues, the comparatively small market size for artificial limbs and the need to make his startup succeed. But he is not worried in the way he once was. Although Mr. Caputo describes himself as “super impatient,” he said he feels less pressure to know everything as an entrepreneur than he once felt. He has grown comfortable not having all the answers. Rather, he’s willing to continue road-testing business strategies, trusting his gut and allowing some answers to unfold naturally in matching product to market, passion to profit.